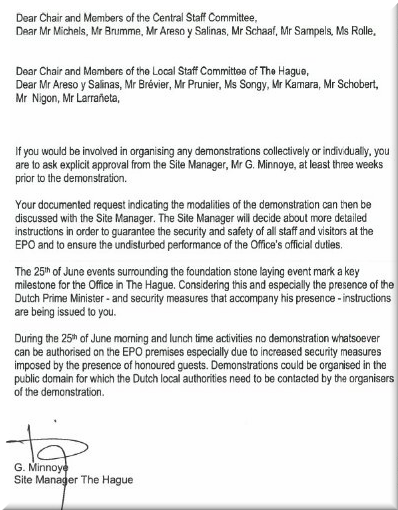 THE oppressive management of the EPO likes to use “security” as an excuse for banning law-abiding demonstrations. We have already covered numerous examples of that. It’s part of a pattern. “The EPO is still trying to push the protests off the premises of the EPO and into more dangerous places like roadsides, demonstrating disregard for human life (as if the unprecedented denial of investigation into suicides wasn’t enough evidence of that).”The claim of “security” is directly contradicted by the fact that similar demonstrations were allowed and tolerated when organised by groups other than EPO staff. It’s all about saving face and avoiding embarrassment to the management, it’s not about security. The letter from Mr. Minnoye (left the EPO earlier this year) shows how Battistelli and his cohorts bend backwards to prevent Dutch authorities from receiving information. The following year the EPO paid a large sum of money to a PR firm, in order to specifically target Dutch media.